The title is a quotation from Anne Waldman’s new book IOVIS. It is a subtitle of a part, in which Anne Waldman describes meeting an old colleague of hers. Touching one’s lips to reality? One is the wish to create a compositional form which would audibly and visually express structural movements of the mind – how I perceive it. I consider these movements as a biotic process: fluid layers of consciousness and awareness, my awareness jumping layers as the focus of attention shifts. Perceptions of environment are included as part of mind-activity. Sometimes the mind seems to be more resting in one level/layer, at other times it is quickly shifting focus (daily multitasking), oscillating. This flexible process involves vivid movement and textural changes. Corresponding to re-composed layers of mind activity I chose five staves for the flute/vocal-part. Each one describes a different state of consciousness. It is not a system of staves in the ordinary sense. For the flutist, reading the score is like switching levels in a computer-game: every stave represents a different emotional and textural context. On top of the system is the watching activity, the facet of mind that is reflecting on itself and watching itself – the ability of mind which seems to monitor every other activity, and the resulting ongoing commentary. The text for this stave was written by myself, based on my own perceptions. This text has to be spoken with a closed mouth. It is monitored by the throat-microphone worn by the flutist. This gadget was originally developed for military use, for clear communication in loud surroundings, such as combat or inside a tank. It uses electret membranes to pick up sound, and signals are transmitted via radio between persons. The PTT button needs to be pushed for communication. Performing the piece, the flutist has to push it with her foot, to communicate with the live-electronics. Sounds are then picked up and transmitted to my live-electronic setup. This leads to another idea behind this piece: I wanted to avoid writing longer periods of precisely defined rests, which would imply counting (of beats, or seconds) for performer. But somehow, the sense of spacing sounds over time needs to be facilitated. I decided to use the inner monologue, the commentary, as a timer for the other expressions. Instead of counting rests, the performer has to recite pieces of texts with closed mouth. When a text is finished, she moves on. Through this setting I not only achieve an “organic” way of dealing with time and space, I also gain material for further live-electronic sounds. The material from the internal monologue is used for manipulation with programs (Ableton) and analog machines (ring-modulators and KOMA pedals). 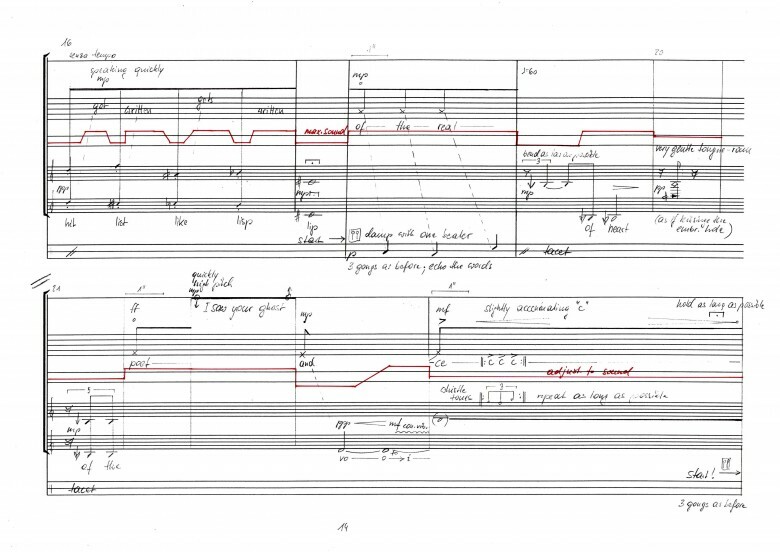 Thus, the electronic part serves as a compositional extension of the voice, creating an audible space around the soloist: fictitious mind-activity of the performer turn into an electronic basso-continuo. I added some sparing percussion, mainly bass drum. The big drum is a symbol of proclamation: in earlier times news was proclaimed by voice and drum. Also, the drum is used as a resonator for other percussion instruments, such as gongs and bowls. The complete libretto was composed from three texts. 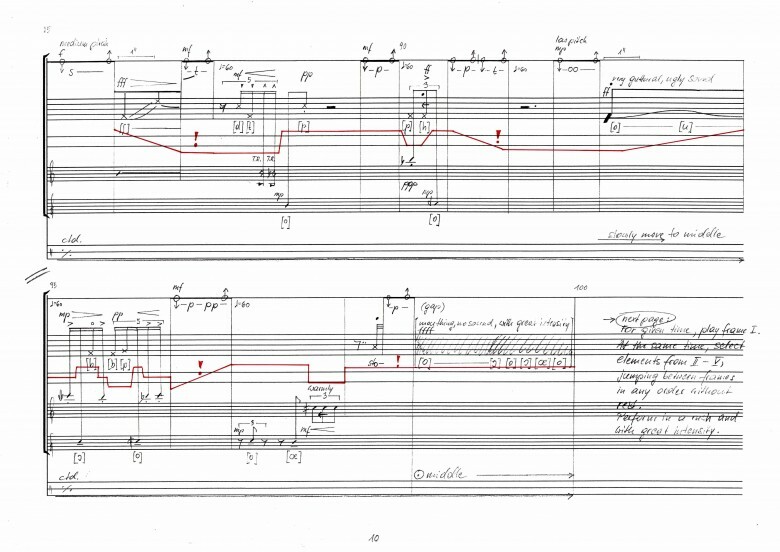 Following the concept governing the piece, the various text-fragments denote different layers of internal activity. Texts for the PTT button are in English and were written by myself. They are audible but cannot be understood by the audience. Other texts are translated fragments from Austrian author Margret Kreidl from “Meine Stimme”. Her text is based on the author’s experience while singing. For part II at the end of the piece I selected a text by Anne Waldman, from “Iovis”. I am very grateful to the authors for their generous permission to work with their texts.